There was very little that Andre Burakovsky could have done to author a better start to his NHL career. The 19-year-old scored his first goal on his second-ever shot, punctuating the milestone by excitedly leaping into the boards. He amassed six points in his first six games, the most by a Capitals rookie to start a career since Alex Ovechkin, and was the team's best possession forward over the span, the Capitals controlling 62.50 percent of shot attempts when he was on the ice at even strength. With Washington mired in a funk (one that is ongoing), coach Barry Trotz elevated Burakovsky to the first line alongside Ovechkin for two games last week. Not bad for a kid who began playing center during development camp scrimmages in July. Burakovsky, however, faced his first adversity Sunday in the Capitals' 6-5 loss to the Coyotes, skating a career-low 7:42 (though that was partially a product of a penalty-riddled game). Trotz has spoken of ice time as his primary instrument of change, which he wielded after repeated instances of lax defensive-zone coverage by Burakovsky. "I thought that he's got too much drift in his game, drifting off pucks," Trotz said Tuesday following Washington's morning skate. "Good example was the fourth goal [against Arizona], he drifted off the puck and they had an easy walk to the net. Those are things that he's learned. I've talked to him." For Trotz, ice time at the center position is affected by two things: faceoffs and defensive play. Neither have been Burakovsky's strong suits. He has won 39.6 percent of his 91 faceoffs, of which only nine have been in the defensive zone. Through 12 games, Burakovsky is one of the Capitals' most sheltered players with a 66.15 offensive-zone start percentage at even strength. "Offensively, you can put people 200 feet away from your net and if they're good offensively, you can use that time," Trotz said. "But managing the game a little bit, that's where centermen lose ice time: defensively on draws or defensive zone if they're not as sharp as they can be." Since transitioning to center, adjusting to the different and heightened defensive responsibilities required of the position has been Burakovsky's foremost focus. 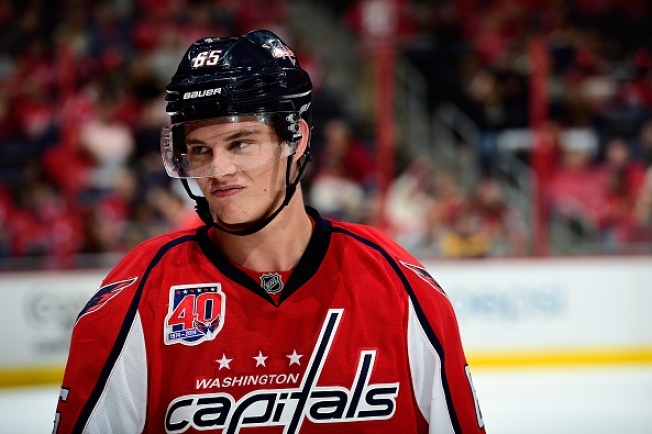 "I've got to work on that every single day," Burakovsky said. "I watch all my shifts on video and I need to really work on it and get better. I've got to work on that a lot everyday to get better on it. What's surprised me most is that if you do like small mistakes, it's going to end up in your net, it's going to be a dangerous scoring opportunity for the other team." Burakovsky learned that lesson the hard way against the Red Wings last Wednesday during a third-period frenzy in front of the Capitals' goal. Burakovsky swooped into the slot to corral a Brooks Orpik turnover, but attempted to curl out of danger instead of making a safer play. Justin Abdelkader pickpocketed him and immediately put the puck past Braden Holtby to tie the game. "It happened fast. The league is fast," Burakovsky said, recalling the aforementioned sequence. "I just got the puck in the middle and I saw the guy coming at me and tried to take it to the corner and go from there, but he got a good stick on it. When I look at it now, when I think back on it, I should probably just shoot it out, get an icing or something, something like that. "That is stuff that I have to get used to. I'm in a learning process. I'm not a pro yet. There's stuff I have to work on and stuff like that is one part of it. It's a learning process." Trotz is not concerned about Burakovsky, knowing that most young players tend to hit a proverbial wall within the first month of their careers. Burakovsky received more of a normal workload Tuesday in Washington's 4-3 overtime loss to Calgary, skating 13:11, 11:19 at even strength. "That's what you see in the National Hockey League," Trotz said. "You see that almost all the time, there's exception to the rule. You'll see guys get off to really quick starts as young guys, and then they sort of hit I'll say a 10-game sort of transition period where, 'Now I'm here,' but then all of a sudden, they're not scoring. ...You see younger players sometimes fall off a little bit. "I'm not worried about Andre. Andre's a great skater, he's got great offensive instincts, he's a sharp kid. I'm not worried about him all. ...To me, he's going to be a top player in this league and a centerpiece, one of the centerpieces of our team for a long time."